​If you have a thing for the classic designs and elegance of bygone eras, then you'll adore our Elegantly Antique thank you cards. Each corner is adorned by a blue pattern reminiscent of your grandma's old china. Scrolls, balls, and curls are incorporated into the design for a luxurious look and feel. Customize with your own wedding font and personalized greeting welcoming guests to your big day. Design works well with a range of wedding themes and also comes in save the dates, response cards, table cards and more. 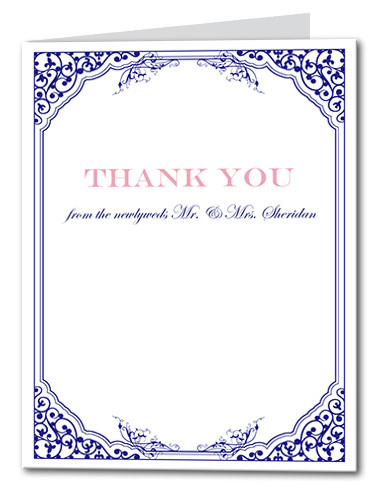 Elegantly Antique Thank You Card For the best experience, we recommend personalizing your stationery on a desktop computer.